With increased usage of laptops and smartphones, their battery goes down quickly, and one needs to charge it at regular intervals of time. It is easy to keep your device charged when you are at home or office, but what do you do if you are in a car or on the move? This was a problem a few years back, but with the arrival of car chargers you don’t have to worry about your phone going off due to low battery. A car charger keeps your mobile devices charged while you are travelling. So, if you have plans of going on a road trip, then a car phone charger must be a part of your travel bag. This will help to keep your phone powered to help you with the route to the destination and to make contact in case an emergency arises. Nowadays, more advanced features are being added to the smartphones; however, the capacity of the batteries is not being enhanced to keep pace with these features. Battery capacity has not witnessed any significant changes the way smartphone technology has. Phone applications are getting powerful and bigger, which are affecting the battery. They need to be charged within a few hours of usage. Therefore, you need to charge the phone more often to keep it running continuously. This is the reason why a car phone charger is a necessity. There are several types of car chargers available in the market and you can choose one suited to your requirements. However, you need to keep a few things in mind while using these chargers. Here are some tips which will be useful for you while using a car charger and help you maximize its life. 1. Avoid drainage of the car battery: While charging your phone through the charger, you need to make sure that the battery of the car is not drained. If you keep the phone charger plugged in even if you are not charging anything, it starts draining the battery of the car and can exhaust its power if the engine of the car is not running. This means that your car will not start, and you will be stranded. To avoid such situations you should unplug the charger from the power source of the car when it is not in use. 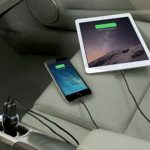 There are advanced car chargers available in the market which are used for iPhone and Android phones and have protection that cuts off the power supply when the battery is fully charged. These chargers don’t drain the power of your car battery needlessly. So, while buying a charger, do check if it has safeguard properties to save your car battery from draining after the device connected is fully charged. 2. See if the charger is compatible with all types of devices: When you buy a car phone charger, you need to make sure that it is compatible with your own mobile and all the other devices which you will be charging while travelling. Almost all car chargers are made compatible with universal USB charger standards. However, there are still a few chargers available in the market that are manufactured before these standards were set. It is recommended to carry a charger which is compatible with your devices while you are travelling in order to avoid any issues. 3. Don’t degrade your cell phone battery: It is important to note that keeping the device connected to charger even after it is fully charged can not only drain the battery of the vehicle but can also degrade the phone battery. It can reduce the lifespan of the battery. As soon as your phone is charged unplug it from the charger. This is crucial to maintaining the life of the phone battery. By keeping your phone or any other device connected to the charger even after they are charged can shorten the life of the device. So, use your car charger with care. 4. 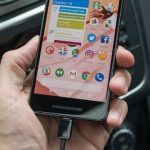 Charge faster by turning off the phone: Some smartphones get charged very fast, but some are extremely slow to charge no matter what type of charger you use for them. So, you need to make use of certain procedures to charge them faster. If you want to increase the speed of charging the phone while using a car phone charger, either put your phone on airplane mode or switch it off. By doing this, you reduce the rate of consumption of power by the phone to null when it is connected to a charger. This increases the rate of charging remarkably. 5. Avoid Overheating: We are all aware that overheating can cause certain problems to the smartphone. Even while charging it with a car phone charger, you have to be careful and make sure that the phone doesn’t overheat. Most car chargers these days have protection against overheating and smartphones are also manufactured in the same way. However, instead of relying on these features of the device, it is best to be a little vigilant and ensure that the phone doesn’t over-heat while being charged. 6. Be Consistent: While you are travelling, don’t wait for your phone battery to be drained off completely. If this happens your phone will be switched off and it will require more time to restart. This also means that more car battery power will be used. To avoid this, charge the battery before your device dies. The tips mentioned above will be useful for you while charging your phone using a car charger. However, you have to be smart while choosing the charger. 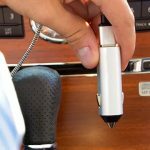 The car charger should not only keep your phone powered up throughout the journey, but it should make your drive convenient. Buy a smart car charger which will charge your phone quickly and safely while keeping you informed about the charging status and voltage of the car battery. It should be adaptable to both your phone as well as the car.